The 3D Skier was made to give a realistic look to all of the graphics and animations on the site. The 3D Skier makes it a lot easier to relate the positions shown to real life, making a lot of the more techincal aspects easier to understand. The 3D Skier has the same size limbs as a normal person, with the same amount of movement in each limb, this means that the skier can not be put in any position that is not possible for a human. This again increases the realism in the graphics and animations and helps to demonstrate manoeuvres. As with the graphic on the right the 3D Skier also makes it possible to show things that would not be possible in real life, with the ability to take pictures of the same position from any angle, or even make animations of a single moment in time. 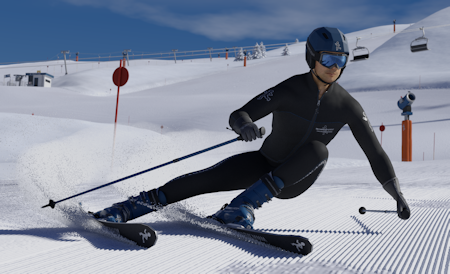 The 3D Skier is currently being updated to use a more advanced setup with higher resolution meshes and better rendering, which will enable even more detail and realism in future graphics.